You can find a number of articles about Bob Paladino & Associates. Below you'll find just a few of the articles we've been featured in or written. Harvard Business School Press - "A Balanced Scorecard Hall of Fame Profile"
Have you read the #1 most popular Hall of Fame Case study as rated by Harvard Business School's website, from over 80 published? This in depth case study reveals how Crown Castle International leveraged its CPM Office and the Balanced Scorecard, along with over 25 Hall of Fame best practices to drive significant results. Gain insights from the CEO and from Bob Paladino, CPA. Strategic Finance Magazine - "Strategically Managing Risk in Today's Perilous Markets, Understand how to Integrate Strategic Planning and Enterprise Risk Management"
In this feature article, author Bob Paladino explores practical application of the COSO ERM framework consisting of eight interrelated components by United Illuminating (UI), an award winning organization; and its integration of Strategic Planning and ERM, and the use of a process based organization. Canada: Certified Management Accountant (CMA) Magazine - "for Strategic Business Ideas"
Author Bob Paladino provides three successive articles containing over 30 best practices used by the City of Coral Springs, Florida to drive performance. Coral Springs, recent Baldrige, Sterling, and APQC award winner, is a case in his #1 best-selling book "Five Key Principles of Corporate Performance Management". Harvard Business School - "How to Conduct a Balanced Scorecard Review to Create Strategic Alignment"
In this article, Bob Paladino shares his insights into evaluating your Strategy and Balanced Scorecard program to identify shortfalls and gaps, and to align strategic objectives, measures, targets, and initiatives. Companies become handicapped by limited, low-quality data views when they allow the information that is already available, and is easiest to gather, to determine how they manage the business. It makes sense that an organization should first make decisions about their strategies and information requirements, then subsequently align information assets to support strategy management. But many companies continue to operate in reverse. Businessweek Research Services - "the Payoff Of Pervasive Performance Management"
Joe Mullich interviews Bob Paladino and leading executives at top US Corporations for their insights into aligning corporate performance management (CPM) balanced scorecard measurements vertically and horizontally in organizations to drive value. This article by Sebastian Francis and Bob Paladino explores what leading companies with robust, best practice-based CPM and ERM programs know that could benefit your organization. This article, which draws on research with 17 leading private- and public-sector organizations and details CPM, Balanced Scorecard, and ERM practices your organization can use. Bob Paladino, author and keynote speaker for Microsoft Denmark addressed 150 European CFOs in Copenhagen on his #1 release, Five Key Principles of Corporate Performance Management. Bob Paladino is interviewed by Computerworld's Jan Horsage on emerging trends and best practices in global CPM. Paladino outlines the CPM Office and Officer, one the 5 Keys central to success. [Read the article here] (Link http://www.computerworld.dk/art/43017). In this feature article "Excellence in Global Corporate Performance Management" author Bob Paladino describes how InterComp Technologies has aligned employees from Moscow to St. Petersburg and from Budapest to Geneva to strategically manage its meteoric growth while achieving global customer satisfaction. Latin American magazine features Corporate Performance (Desempeño corporativo) and provides an encapsulated view of Bob Paladino's thoughts. Essentially stating the highest level of the managerial perfection can be achieved by the application of technology, but only if the operative and cultural barriers are addressed. The administration of CPM leverages key information sets. Susie Gyposos article "Shedding light on what sets great firms apart" provides a summary of #1 release "Five Key Principles of Corporate Performance Management". Susie Gyposos states, "Individuals who have been searching for a book that examines every nook and cranny in the world of corporate performance management (CPM) can now rest easy. Help is at hand in the form of a new publication by one of the biggest names in this fast-growing field. It contains copious examples and multiple methods showing how to integrate best practices in different work environments and achieve optimal results." Bob Paladino is interviewed by author Karen Henrie about the role of Business Intelligence (BI) in managing your global Corporate Performance Management (CPM) Balanced Scorecard program. CPM can often reveal areas in which companies are wasting eye popping amounts of money. Companies are also evolving their strategic objectives and so to are their measure and target sets changing to measure progress. In this article "Principles of Corporate Performance Management", Bob Paladino describes Malcolm Baldrige and APQC Award Winner Medrad's customer intelligence and product innovation best practice processes. "Medrad is a best practice company in translating customer requirements into product innovations and managing by the Balanced Scorecard." 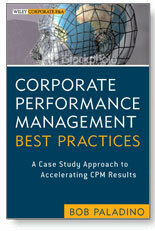 In the article "Performance Management - Why CPM Needs it Owns Office" authors Gary Cokins & Bob Paladino share experiences in dealing with companies struggling in Trace's management model, and offer evidence supporting formation of a dedicated CPM Office and Officer to address today's managerial challenges. Bob Paladino, in his trilogy series on "Five Key Principles of CPM" describes how Malcolm Baldrige, Balanced Scorecard Hall of Fame, APQC, Sterling Award winners observe common principles and best practices to achieve results. In his article "Retaining Knowledge Capital" Bob Paladino explores how TVA, the largest US producing Utility dealt effectively with the brain drain through its Knowledge Management program. Bob Paladino advises and co-authors with experts David Axson (founder SonaxGroup), Sebastian Frances (APQC), Angelica Wurth (APQC) and executives from leading exemplar organizations Blue Cross Blue Shield, United Illuminating, First Energy, Split Rock, and Fonterra. Harvard Business School Press provides profiles award winning Hall of Fame Balanced Scorecard Hall of Fame companies including Crown Castle International, an effort led by Bob Paladino, leader of Bob Paladino & Associates, LLC. Drs. Kaplan and Norton's Balanced Scorecard Collaborative (now Palladium) provides an in-depth discussion of the Crown Castle International award winning Hall of Fame story. Learn about the CPM/Balanced Scorecard program's innovative implementation of best practices globally to drive financial, customer and operational results. Drs. Kaplan and Norton's global bestselling book describes how Crown Castle International successfully cascaded and aligned its Hall of Fame Balanced Scorecard program globally. Drs. Kaplan and Norton's global bestselling book provides a review of Crown Castle International's Hall of Fame award winning performance. Secure insights from CEO and SVP Global Performance Bob Paladino and their multi-year journey. Crown Castle International, a leading telecommunications and wireless infrastructure, the BSC was seen as a strategic execution tool from the onset. Helping a global and decentralized work force maintain laser like focus the company's strategy, the BSC and down to earth strategy map have also helped the company realize performance breakthroughs while their competitors struggle for survival. This is the CEO's reflections on the Crown Castle Journey. Few companies have implemented the Balanced Scorecard and Strategy Focused Organization principles as quickly and as successfully as Crown. The CEO of Crown Castle discusses global alignment and how the BSC has been used to rationalize corporate wide initiatives to drive shareholder value. He discusses how measures were refined through the journey to improve information value. Bob Paladino authors this Corporate Performance Management article to describe the integration of the Balanced Scorecard, Six Sigma, and Knowledge Management. This article explores the approach, implementation and results through a live case study. The American Productivity and Productivity Center reports on Bob Paladino's Corporate Performance presentation. This report covers best practices in Balanced Scorecard implementation to win the coveted APQC Best Practice Partner award, as well as the coveted Kaplan and Norton Hall of Fame award. Bob Paladino, in his article "Balanced Forecasts Drive Value" describes how Balanced Scorecard Based Budgeting has been used strategically and operationally at Crown Castle International to understand the relationships among financial, customer, operational and people objectives, measures, targets and initiatives to dynamically run the business using falling forecasts. In Chapter 1, Bob Paladino outlines key components of a Balanced Scorecard program including development and integration of strategy maps, balanced scorecard measures, targets, and initiatives through an in depth case study. He also describes key types of measures and methods for setting targets. Bob Paladino describes how Crown Castle International used a KM survey to design and lead tiger teams to take its KM portal to the next level. In this article he outlines the approach and building blocks to the KM portal including key applications, best practices, balanced scorecards, and customer information.